What’s the Process for Dental Implants in Temple? The process for dental implants depends on many factors, including how many teeth you need to have replaced and where in the jaw they are located. But no matter the technique used for your implants, the end result is a sturdy, life-like tooth replacement that will last for years. Keep reading to learn more about what you can expect when you’re getting dental implants in Temple. The implant post, which you never see after it has been implanted. This part is usually made of titanium. The abutment, which connects the dental implant with the replacement tooth. 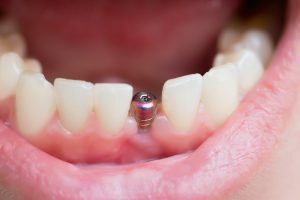 The abutment can be made from titanium, gold, or porcelain (for front teeth). The replacement tooth or teeth, which may be a crown, a bridge, or a denture. This is the part that you see. Before the implant process can begin, you will need to meet with your dentist for an initial consultation. During this appointment, we will evaluate your oral and overall health to make sure you are a viable candidate for dental implants. If so, we will take X-rays and photographs of your oral structures to determine the best method of placement for your dental implants. If you need to have a preparatory procedure performed first, like a bone graft or sinus lift, we will schedule this with plenty of time to recover before the implants are placed. A timeline will be created so you know just what to expect throughout the procedure for your dental implants. When the dental implants are ready to be placed, we will perform this procedure under anesthesia and sedation as desired for additional comfort. To begin, your dentist creates a hole in the jaw bone where the missing tooth’s root was. This is where the implant post is inserted. Because it is made of titanium, a material that promotes the growth of bone tissue, the dental implant will gradually fuse together with the jaw. This process is called osseointegration, and it is what makes dental implants so successful. It occurs gradually — 5 months to a year may be needed to complete the entire dental implant process. After osseointegration is complete, the dental implant(s) can be restored with the crown, bridge, or denture. Your dentist will expose the top of each implant post and connect the abutment. Some implant posts already have abutments attached and can be restored on the same day. For the traditional type of implant, though, you will undergo one more brief healing period after the abutment has been attached. Then you return to your implant dentist’s office to receive your new prosthetic tooth/teeth. Dr. Richard Fossum and Dr. Brooke Elmore offer comprehensive dental care, including oral surgery services, at Fossum Dental Group. To learn more about the dental implant process or to schedule an appointment, please do not hesitate to contact the office at (254) 778-3900. Comments Off on What’s the Process for Dental Implants in Temple?